Walking back from Top Pot Doughnuts, we caught this view down 68th Street NE. 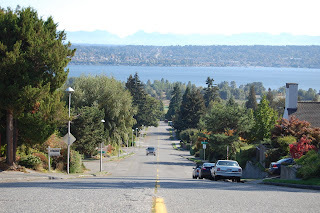 Lake Washington, Kirkland, and then the Cascade mountain range is visible in the distance. The road inline in the distance is NE 85th Street (which becomes Redmond Way).